Likewise, why is the Syrian air force being forced to hide its planes and helicopters in its own country, while Washington steams an armada of warships toward the Mediterranean that is larger and more lethal than the entire Navy of almost every other country in the world? The answer is simple and terrible: Washington has become the War Capital of the planet and now teems with a whole generation of war-obsessed bureaucrats, think-tankers, consultants, lobbyists, militarists, imperialists, neocon belligerents and the legions of military/industrial/spy complex racketeers who feed off a hideously bloated national security budget. Of course, you also have thousands of politicians---both those now in office and those who hang-around afterwards and get prosperous by hanging-out a shingle to ply the business of operating Washington's global empire. Among them are the brainwashed, the stupid, the larcenous, the sanctimonious, the venal, the flag-wavers, the sunshine patriots and the ideologues of American exceptionalism, responsibility-to-protect (R2P), democracy propagation and plain old imperial hegemony. Needless to say, our purpose here is not to play the name game. Instead, we are trying to color, characterize and concretize what we mean by the Deep State, and to explain why the latter is carrying on such a relentless, vicious and dark campaign to take the Donald down---even at risk of war with Russia and nuclear armaggedon for the entire planet. It's all encapsulated in two words: America First! That was the Trump campaign slogan and tonality that sent the Imperial City into paroxysm of outrage and sanctimonious harrumphing. That's because at the end of the day America First invalidates the very modus operandi of the War Capital, and all its projects, pretensions and illicit prosperity. After all, in a world of America First, what happened or didn't happen in Douma would be of no moment with respect to homeland security. 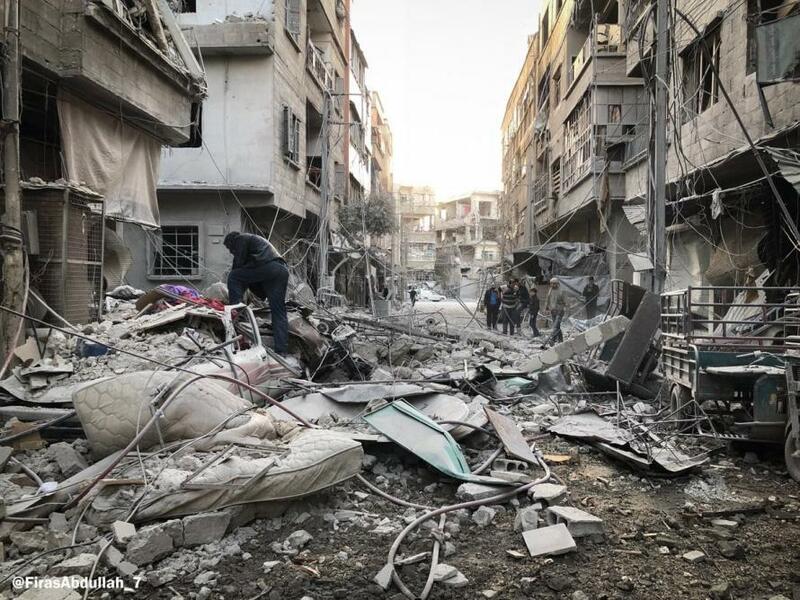 In fact, here's what Douma looks like today, and no everyday American would ever confuse it with an existential threat to his own safety or liberty. Obviously, Douma is just the poster child for the illicit warp and woof of the entire American empire abroad. The civil war in Syria was essentially a proxy battle between the Sunni and Shiite branches of Islam. As such, it extended across the entire middle east, encompassing Saudi Arabia and its Sunni allies on one side and Iran and its Shiite allies including the Washington supported government in Baghdad, the Washington demonized government in Damascus and the Hezbollah faction of Lebanon, on the other. In one form or another this clash has been going on for 1300 years, and its current manifestation bears not a whit of consequence for the safety and security of the citizens of Lincoln NE, Spokane WA or Springfield MA. Accordingly, not one ounce of American blood or one dollar of American treasure should have ever been spent on it. Alas, America First understands that truth intuitively and unequivocally. And that knowledge Imperial Washington could not abide. Likewise, America First comprehends that the Persian Gulf is no American Lake and that it is in no way the business of the Fifth Fleet to police. Oil is a matter for markets and economics---meaning that high prices, shortages and supply interruptions are their own cure. In fact, America First recognizes that in this day and age the US doesn't even need a Fifth Fleet because its is useless to defend the homeland (that takes nuclear deterrence which we already have in abundance), and is only good for extending, occupying and policing an Empire that undermines homeland security and bleeds the nation's treasury. So too, the case of Ukraine. If the Crimeans chose to return to the Russian Motherland by a 90% referendum vote, which they were part of for upwards of 200 years after the peninsula was purchased by Catherine the Great in 1783, so be it. Similarly, if the Russian-speaking, left-leaning population of the Donbas (eastern Ukraine) wishes to succeed from a regime in Kiev dominated by anti-Russian Ukrainian nationalists and proto-fascists, they have every right to do so---not the least of which is memorialized in a document penned by Thomas Jefferson, Benjamin Franklin et. al. in 1776. As a practical matter, whether the output of coal, chemicals, steel and other industrials by the 5 million people of the Donbas is chalked up to the GDP of Ukraine, Russia or a newly christened republic would not make an iota of difference to homeland security in the United States. Indeed, it is difficult to think of developments anywhere on the planet which bear less on America's security than the status of the Donbas. Well, except perhaps whether the Chinese want to waste their money building military bases on sandbars in the South China Sea. In a similar manner, America First is OK with the sovereign determination by the Germans that their national security is adequately served by spending a mere 1.5% of GDP on defense, and that the route to peaceful relations with Russia is through more commerce and trade, not military build-ups and pointless provocations in places like Syria (Germany is not joining the Donald's impending war there). Stated differently, America First understands that if the Germans don't expect to be invaded by Putin, exactly why is Washington bleeding its Treasury piling up conventional armaments on the other side of the Atlantic? And that gets us to the meat of the matter: America First is an existential threat to the Deep State. It turns the clock back to April 2, 1917---the date when the Woodrow Wilson foolishly declared war on Germany and led America into a bloody cauldron on the Western Front that had absolutely no bearing on its national security; and thereafter into a destructive "peace" at Versailles that guaranteed perpetual war. America First, when followed to its logical and correct conclusion, would put the War Capital of the world out of business; it would result in a massive slashing of the hideously bloated national security budget; it would ash-can the endless complex of think-tanks, NGOs, intelligence contractors and lobbyists for foreign interests. We refer, of course, to the likes of the Podesta brothers, Paul Manafort and 20,000 more like and similar operators and racketeers. Indeed, having it way with the Warfare State, America First would bring a hair-curling recession to the Imperial City which would make Youngstown Ohio look like a model of prosperity. To be sure, we seriously doubt that the Donald had any idea of where American First was leading him when he stumbled upon the slogan; and we are afraid that his xenophobic fear-mongering about the Mexican border would have distracted him, anyway. But the Deep State was taking no chances. That's why the partisan shills who ran the CIA and FBI under Obama were able to launch their insidious anti-Trump witchunt as an "insurance policy" in July 2016; and it's also why the Obama Administration pulled out all the stops in its waning days in office to insure that the verdict of November 8 would be re-litigated on the back of the Russian Meddling story. In Part 3 we intend to summarize the ludicrously threadbare nature of the whole Mueller investigation, but suffice it here to note the Smoking Bunker Buster that puts the lie to the whole scam. To wit, it is absolutely the fact that neither Donald Trump, nor his sons, nor his daughter and son-in-law went to Russia at any time after the Donald's unlikely campaign was launched in June 2015. At that time no one including Vlad Putin gave him a snowball's chance of ending up in the Oval Office; and since then Trump has proven that no one matters in his comings and goings except the Donald and his family. So if there was any collusion after the announcement, it had to be by email or phone between the Trumps and high state officials in the Kremlin. That is to say, every word of such conversations would be stored in the vast NSA (national security agency) server farms where everything which crosses the worldwide web gets snatched and stored. Needless to say, if Robert Mueller were truly doing god's work in behalf of the rule of law and American democracy, he would have ordered-up the NSA taps on day one, and resolved the matter of "collusion" with the Russians within one week's time. That he didn't do because no such taps exist and no such conversations between the Trumps and the Russian state ever happened. Period. Full stop. To the contrary, the entire prolonged, ballyhooed, ever-expanding, leak-ridden, media-fueling Mueller investigation is designed to mortally wound Donald Trump and drive him from office. That is, to crush America First in its infancy and to obliterate even the crude and half-baked form in which its emerged from the modest gray matter nested under the Orange Comb-Over. In that mission, the Mueller witch-hunt has already succeeded. The Donald has become so punch drunk from its malicious and vicious assault that he has simply capitulated, and his tweet of the morning lets the cat fully out of the bag. To wit, less than two weeks ago he was embracing the famous strategy of Senator George Aiken, who in the midst of LBJ's insane invasion of Vietnam explained how to end that pointless war: "Declare victory and go home" said yesteryear's profound statesman from Vermont. That's exactly what the Donald was doing when he declared victory over ISIS and announced that America would be going home from Syria, and did so without the approval of his Deep State minders. So doing, it nearly made America First the policy of the land; it was a strident statement of the fact that the Doumas of the world may be human tragedies, but they are not threats to America's security--nor are they the business of Washington's war machine. But the War Capital could not abide the thought, and this morning the Donald explained that he has now gotten his head "right", after all. That wasn't a statement about second thoughts on attacking Syria; it's an expression of the rationale the Donald is preparing to use in order to camouflage his abject surrender to the War Party. That is to say, the anti-ISIS mission is complete---so now on to saving the world from the Iranians and the Russians. Needless to say, bombing now vacant Syrian military installations into smithereens will not possibly accomplish that objective and will only make the risk of WWIII that much more palpable. In fact, the surest way to get ISIS back is to destroy the Syrian government and thereby open the gates of Hell, as did Dubya back in 2003. Either way, it's Mueller's War and the evil of it is near at hand.